Confined space is an area that has limited space and limited openings for entry and exit. Examples of confined space include tunnels, silos, vats, access shafts, truck or rail tank cars, manholes, and storage bins. These spaces should be occupied for short periods of time only, and always while taking necessary precautions. Confined rescue and self-rescue are more difficult than in ordinary circumstances. Often, confined spaces can contain walls that curve inward or floors that slope downward, and have the potential to trap or asphyxiate. Other hazards encountered in confined spaces are unguarded machinery, exposed live wires, or temperature-related risks. Perhaps the biggest danger is in the air—a person may not always have adequate access to natural ventilation, resulting in workers coming into contact with air contaminants or dangerous gases. To maximize safety, many North American states and provinces make it mandatory for workers that frequent these spaces to receive specialized training. The exact content of confined spaces training should depend on the type of industry that the training is being provided for as well as specific regulations that apply to the jurisdiction and type of work. But most confined spaces training isn’t complete without including the following topics. When discussing confined spaces with employees, the basic legal requirements and definitions should be discussed. 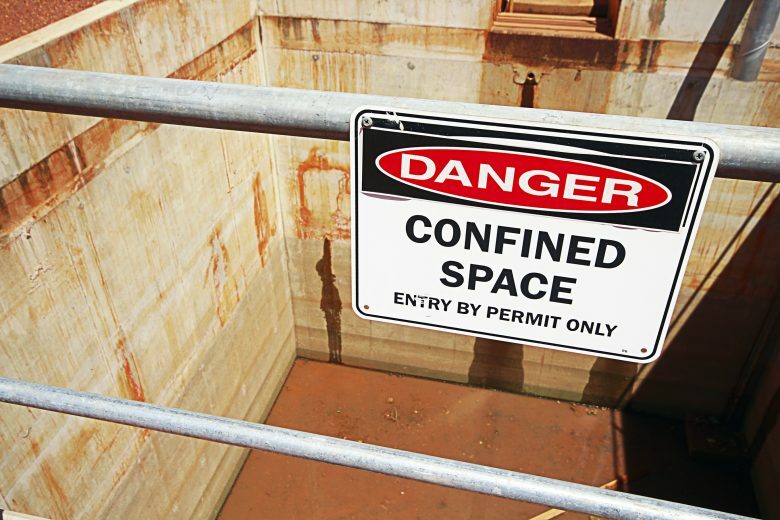 Confined spaces are regulated when they have the potential to contain, or already contain, a hazard (i.e., hazardous atmosphere, sloping walls, etc.). If there are hazards identified or calculated with a proper risk assessment, then they require a pre-entry checklist. If the checklist confirms the potential for or an existing hazard then the space must be classified as a “Permit Required Confined Space.” Once confirmed, a permit must be filled out and then an attendant and entry supervisor are added to the mix to ensure everyone’s safety. When it’s difficult to escape a space, avoiding a potential threat or removing the hazards themselves can be an involved task. It’s important for employees to be diligent and have the tools to properly assess risk. In fact, it’s mandatory to perform a pre-entry checklist to identify hazards or the potential for hazards. This part of confined spaces training must meet requirements and emphasize hazard control procedures. Employees should know about different types of dangers and safety hazards they may encounter in a given space and how to react to them. No one should ever assume that something is safe just because it seems safe. The more comfortable employees are with all the given solutions to potential hazards, the more likely they will be to use them quickly and efficiently, even when faced with a dangerous or distressing situation. Practice and repetition is a good way to help workers develop an automatic response to certain situations. However, it’s important to ensure that comfort with equipment and procedures doesn’t develop into complacency. Being overly comfortable with safety hazards can sometimes lead to people ignoring or missing warning signs or even taking short-cuts. For example, if the risk assessment becomes a chore to tick off rather than concentrate on, the results could be potentially catastrophic. Complacency is one of the most common causes of injuries each year and the concept should be included in the employees’ hazard recognition training. If they are taught to recognize and address this state, they will be more likely to always remain fully aware of the risks they’re exposed to and never take a short-cut. Personal protective equipment is required in almost all confined spaces, and employees must be properly instructed on how to use it appropriately. Workers should know and understand how to use all types of relevant PPE, from respirators and other breathing equipment to protective gloves and harnesses. In many circumstances, training should also include the use of a system that includes winches, tripods or davit arms in addition to harnesses and other various equipment. PPE training will provide them with the knowledge and the understanding that they need to safely use the tools that are there to protect them. The same is true for the attendant (also knowns as the safety watch or standby), who monitors the situation from outside. If they have access to rescue equipment such as safety harnesses, lifting equipment, or a lifeline, but don’t know or remember how to use them properly, then the safety of their colleagues is in jeopardy. Relevant training will allow them to address any emergency situation in a timely and safe manner, giving their colleague more of a chance to emerge from a dangerous situation unscathed. Workers also need to be aware that rescue teams (entry, non-entry and self-rescue) require CPR/first aid training and an annual drill. And even though only one member of the team needs to have CPR/first aid training, communicating this standard to every employee will give them a more thorough grasp of what the company’s obligations are when they require workers to enter a confined space. Monitoring devices not only keep workers informed of the situation while they’re in a confined space, but they also help assess if that space is safe to enter in the first place. Employees must understand that testing for flammable gases and vapors and potential toxic air contaminants is paramount before any work can begin. The same is true for oxygen levels: assuming that there’s enough oxygen in a confined space without testing for it first is dangerous. Testing for gases should include as many combinations as possible. Toxic gas hazards vary depending on the space your employees need to enter, and it would be a mistake to assume that, for example, only carbon monoxide is a possibility. There are many multi-gas monitors available on the market that can measure a number of gases simultaneously, giving employees a better understanding of their working conditions. Monitoring devices require regular maintenance. If employees are confused about how to bump-test and calibrate their gas monitors or about how often they should do it, the monitors might become a confusing encumbrance and not a useful safety tool. Training should include and address the detailed function and maintenance of all equipment used on the job. Human factors safety training is largely neglected when companies conduct confined spaces safety. A great amount of attention is given to performing a job or handling hazards without addressing the possibility of human error. Incidents are most likely to occur when an employee’s headspace prevents them from giving a job their undivided attention. When workers rush through a job to ensure its completion, when they are frustrated, when they are fatigued, or when they’ve performed a job so many times it has skewed their perception of risk, they’re more likely to make mistakes. The best confined spaces training addresses these human factors in addition to physical hazards, procedures and equipment. When it comes to areas that have the potential to pose significant risk, specialized training beyond the required basics should always be provided. Confined spaces are no exception, as employees’ chances for encountering a variety of hazards increase in such a work environment. Therefore they need to demonstrate exceptional personal awareness, in addition to the technical understanding of their surroundings. Combining those factors means that your employees will have more tools at their disposal when working in confined spaces or dealing with unexpected hazards. And the more they know and understand of their surroundings and behavior, the safer they are. A person’s state of mind influences PPE compliance. Learn to manage the human factors that stop employees from wearing it.